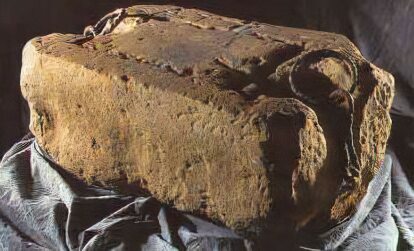 The Stone of Destiny, otherwise known as An Lia Fàil, or the Stone of Scone, revered for centuries as a holy relic, played a central role in the coronation of early Scottish kings, the plain block of sandstone has had a turbulent history, having been fought over, hidden and captured for over 700 years. The stone measures about 26 inches (660 mm) by 16.75 inches (425 mm) by 10.5 inches (270 mm) and weighs approximately 336 pounds (152 kg). On one surface is a roughly incised cross and at each end is an iron ring, intended to make transport easier. The origin of the stone are shrouded in myth. According to mythology the Stone of Destiny, also known as the Lia Fail, used by Jacob as a pillow in biblical times, originated in Palestine and was transported through Egypt, Sicily, Spain and Ireland. Legend goes on to relate that the stone was brought from Ireland to Argyll by Fergus, son of Erc, and was deposited at Dunadd, when the Viking raids started, Kenneth MacAlpin moved it to the Abbey at Scone in Perthshire in 846. Although it has been proven by geologists to be a "lower Old Red Sandstone" quarried in the vicinity of Scone. The late writer and historian Nigel Tranter believed the object Edward took to London was "a lump of Scone sandstone". The practice of seating the ruler upon a stone was practised in Ireland since ancient times. This tradition is understood to be a surviving part of ancient fertility rites. Generations of Scotland's sovereigns, from the ninth century, had been crowned upon the stone. The Stone was used at Iona, Dunadd, Dunstaffnage and Scone for enthroning a succession of Dalriadic and subsequent monarchs. There are various descriptions of the Stone of Destiny. If St Columba's, it was white marble. If Jacob's Pillow, it would have been black basalt. John Balliol became the last king to use the Stone of Destiny in Scotland in 1292. During the Scottish Wars of Independence, the Stone was captured by Edward I of England 'the Hammer of the Scots' in 1296 and removed to Westminster Abbey. "On the 19th of November, as the servants belonging to the West Mains of Dunsinane-house, were employed in carrying away stones from the excavation made among the ruins that point out the site of Macbeth's castle here, part of the ground they stood on suddenly gave way, and sunk down about six feet, discovering a regularly built vault, about six feet long and four wide. None of the men being injured, curiosity induced them to clear out the subterranean recess, when they discovered among the ruins a large stone, weighing about 500l. which is pronounced to be of the meteoric or semi-metallic kind. This stone must have lain here during the long series of ages since Macbeth's reign. Besides it were also found two round tablets, of a composition resembling bronze. On one of these two lines are engraved, which a gentleman has thus deciphered.- 'The sconce (or shadow) of kingdom come, until Sylphs in air carry me again to Bethel.' These plates exhibit the figures of targets for the arms. From time immemorial it has been believed among us here, that unseen hands brought Jacob's pillow from Bethel, and dropped it on the site where the palace of Scoon now stands. A strong belief is also entertained by many in this part of the country, that it was only a representation of this Jacob's pillow that Edward sent to Westminster, the sacred stone not having been found by him. The curious here, aware of such traditions, and who have viewed these venerable remains of antiquity, agree that Macbeth may, or rather must, have deposited the stone in question at the bottom of his Castle, on the hill of Dunsinane (from the trouble of the times), where it has been found by the workmen." 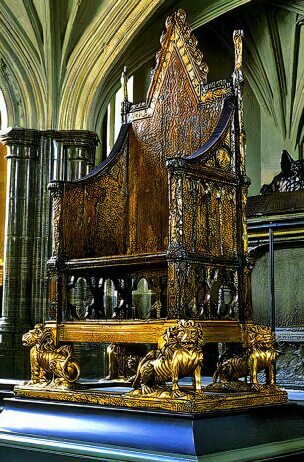 The stone captured by Edward I and taken to Westminster Abbey was fitted into a wooden, high backed gothic style chair, known as King Edward's Chair. In 1297, Edward I commissioned Master Walter, a court painter, to decorate the chair with patterns of birds, foliage and animals on a gilt background. The figure of a king, either Edward the Confessor or Edward I, his feet resting on a lion, was painted on the back. Beneath the seat is a platform and cavity to contain the Stone of Scone. Four gilded lions act as legs to the chair, added in the sixteenth century and replaced in 1727. Only traces of this original paintwork survive and the chair has been much damaged by graffiti. At the Treaty of Northampton in 1328, King Edward III of England agreed to return the Stone of Destiny to the Scots, but riotous crowds prevented it from being removed from the abbey. James VI of Scotland ascended the English throne as James I of England on the death of his cousin Elizabeth I in 1603, but still the stone remained at Westminster. A group of four Scottish students, namely, Ian Hamilton, Gavin Vernon, Kay Matheson, and Alan Stuart took the Stone from Westminster Abbey on Christmas Day 1950. In the course of its removal the stone was broken into two pieces. A major search for the stone was ordered by the British Government, the students risked road blocks at the border to return the larger part of the stone to Scotland, hidden in the back of a borrowed car, they were aided by a new accomplice John Josselyn. Although English, John Josselyn, then studying at the University of Glasgow, was a Scottish Nationalist. Ironically Edward I was Josselyn's 21 times great grandfather, although he was probably unaware of the fact at the time. The smaller piece of the stone was returned to Scotland later. The Stone was given to a senior politician who arranged for it to be professionally repaired, four months after its theft, the stone was then left, draped in a Saltire flag, on the altar of Arbroath Abbey, on 11 April 1951, in the safekeeping of the Church of Scotland. The London police were informed of its location and after a brief sojourn north of the border, the Stone was taken south again to be returned to Westminster Abbey. None of the students were ever prosecuted. In 1996, the then British Conservative Government of John Major, with the approval of the Queen, decided that the Stone should be returned to Scotland when not in use at coronations. On St. Andrew's Day, 15th November 1996, it returned to Scotland after 700 years, the stone was handed over at the border and transported to Edinburgh Castle, where it remains along with the Crown Jewels of Scotland. A replica of the stone is kept in the grounds of Scone Palace in Perthshire.